Kids, Cows and Grass: City girl learns about Christmas on the farm! City girl learns about Christmas on the farm! Guest Blogger: I'm Jen Anderson. A lifelong city girl who recently moved to the country to be closer to my cowboy, Brandon, who raises black angus cattle. I fell in love with farm life just as fast as I fell for the genuine, down to earth man with an incredible work ethic. My 4-year-old son is having fun with the farm, too. So, Brandon and I are planning our future together. In the meantime, since I now live in the country, I absorb as much farm time as possible when I'm not working full-time. Brandon laughs and tells me I have all the time in the world to be on the farm. He's right! I was planning our first Christmas schedule together, before Thanksgiving (yes, I’m a planner). I started figuring out our family plans and asked Brandon what his timing was for Christmas day. It’s then that it hit me. I always knew that the cows needed Brandon, but didn’t stop and think that they need him on Christmas morning when Santa had come and the coffee was brewing and we’d sit in our pajamas together to open presents. Yep, that’s the time he needed to be out feeding, making sure the water wasn’t frozen and checking to see if any cows had given birth yet. Farm work doesn’t get a holiday. Brandon has told me in our discussions about marriage that when I marry him, I marry the farm, too. It was during our talk about Christmas plans that I truly realized what this meant. And, of course, it didn’t change my thoughts or perceptions on this amazing lifestyle that I’m growing to love. So, fast forward to Christmas morning. The entire day was planned out to a T so we could be with both of our families and still get chores done. Wake up, open Santa presents, Brandon to do chores, drive to the city to celebrate with my family, drop my son off with his dad, drive back home to celebrate with Brandon’s family, rest for a short bit and then back out for afternoon chores. Whew! Total whirlwind for our first Christmas together. It was as we were jumping in the feed truck for afternoon chores that Brandon reminded me that a new calf was born early that morning. I couldn’t wait to go see the heifer calf, which is a girl. (Boy calves are bull calves.) I’m learning all of the terminology as time goes along. Most of the time I get it straight, but there are still times that Brandon has to help. The cool thing about every calf that’s born is that it’s a surprise! I love this because I believe in the miracle of the surprise. I didn’t find out what I was having when I was pregnant with my son. If you’ve ever experienced that, imagine that surprise over and over every day of calving season, which is usually 2-3 months. Since he runs a Registered Angus cattle operation, he keeps detailed data on every calf born just like a birth announcement, but with many more measurements! We checked the first pasture for new calves and there weren’t any. I hopped out to open the next pasture gate, as that’s a big help to Brandon. He works so hard all day long and I know I can’t help much since I’m still learning about the cattle business (and working full-time), but I can open and shut gates. We pulled on through to the second pasture, which was mainly empty since the cows were at the feed bunks. The snow was still on the ground, so it was easy to scope the fields for the mom and new calf around the bank of trees. We eased upon them and Brandon jumped out to weigh and tag the calf (meaning to put a numbered tag pierced through the ear, just like a big yellow earring), then he gave it oral medicine. Just then, Brandon asked if I wanted a picture with Mary, the Christmas calf. (It would’ve been named Joseph if it were a boy. They don’t name every calf since there’s more than 150 in this calving season, but this one was special.) I wrapped my arms around the calf for the photo, absorbing the incredible moment of the new calf, the gorgeous sunset with glistening snow and being with my love. What a true gift for Christmas! 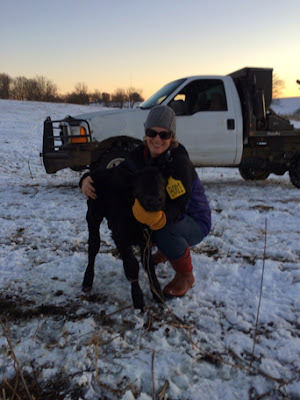 Note from Debbie: Thanks, Jen, for sharing your story of Christmas on the farm! Watch for more stories from Jen--if I can convince her to keep writing for me! Great job, Jen! I never had any doubt you would do less than awesome! And....I'm thrilled you are so happy! I never thought about the fact you don't get a vacation or holiday from farm work. It makes for a unique experience! Life in the country sure is a lot different than the city :) Thanks for sharing a neat story. You're welcome. It's certainly a different lifestyle but one I'm becoming to love so much! Yea! Thanks for the fun story. Wonderful post! Welcome to the farm life Jen! Thanks! I'm working on a new post to come soon. I'm so pleased that Jen was able to share a bit of her life on my blog! Thanks for your comments, friends, and keep watching because I think she may write again for me...or for herself! !